I read through the article with interest, as I do with all articles about religious events. It was a description of a journalist's attendance at a huge Oprah conference, part of a traveling inspirathon called the "The Life You Want Weekend." It was a huge shiny neo-spiritual gathering, as tens of thousands of eager devotees poured into a stadium to hear Ms. O and her retinue dispense vital life-learning lessons. The cost: between $200 and $500 a pop, in exchange for which the attendees got workbooks and weird glowing bracelets, not to mention exposure to levels of ambient atmospheric estrogen so high they temporarily eliminate the need for oral contraception. I harbor no animus towards Oprah. She's intelligent, driven, and capable, and the amazing success she's experienced over the years seems well-earned. Her profoundly American message of positivity and self-empowerment may be big, self-promoting, and high-gloss-shiny, but it isn't evil, and she comes across as a sharper progressive fusion of Zig Ziglar and Joel Osteen. She's willing to engage with spirituality, in a way that is both affirming and open. Sure, it's tempting to snark and roll eyes, but the people she engages sometimes come frighteningly close to describing my own view of existence. Yeah, Deepak is up there doing his Chopra thing, but the connection goes deepah. I mean, sweet Mary and Joseph, Rob Bell? Rob Bell's tagging along for the Oprah dog-and-pony show? I like Rob Bell! His approach to faith is so close to mine as to being almost indistinguishable. I've recommended Rob Bell's books to people! I still do. Does that mean...am I...somehow...in Oprah-orbit? How did that happen? As I read through the article describing the high-gloss perfection of the event, something stuck with me. It was a phrase, one of the inspirational statements uttered during the event. 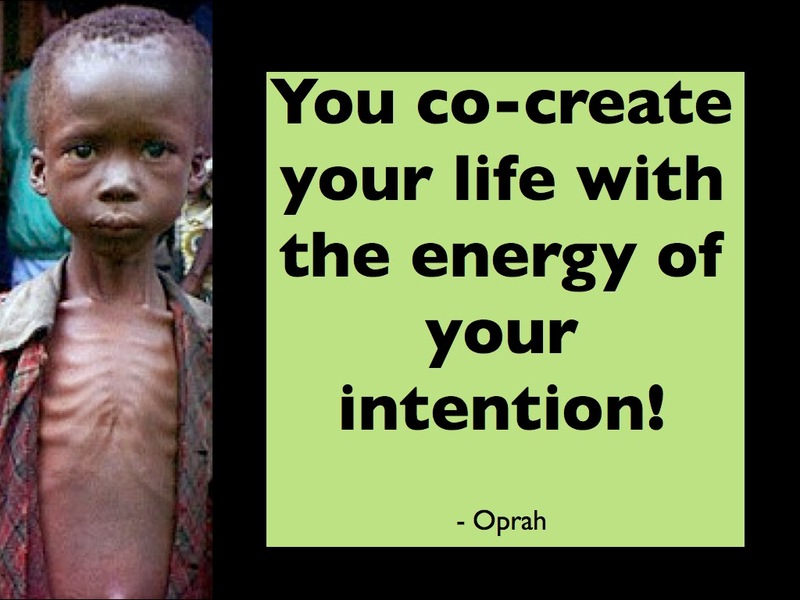 "You co-create your life with the energy of your intention." The language of co-creation is stock-in-trade for many progressive spiritual folk. It speaks to our freedom, our ability to influence the direction of our lives, our fundamental empowerment as sentient beings to shape the world around us. It meshes with my own view of the nature of both being and the Creator, and I'll confess to having used variants of that concept myself on occasion. It's a good truth, a truth that reflects humanity at our best. But I also know that while it is a truth, it is a contingent truth. Meaning, it can be true, but it is not necessarily true. If you're able to drop a couple of hundred bucks on an Oprahfest, then, yes, it probably reflects your encounter with reality. It is also true for me. If you are like a significant majority of humankind, though, it does not describe your reality. The capacity to co-create is tied in to the blessings of liberty, and most of us are not free to act as we would choose. If you are driven by hunger, struggling to simply survive, all of the "energy of your intention" is turned towards that end. The Life You Want is to live, and not die of hunger or thirst this weekend. If you are living under an oppressive regime, be it Putin's neoTzarist Russia, the bizarre Communo-capitalist fusion of the Chinese Central Committee, or the raw brutality of ISIS, you are not free to co-create. You obey, and you keep your head down, or the energy of your intention will be met with the far greater energy of those whose intention is driven by their hunger for power over you. And if, like so many Americans, you are scrambling to pay the bills, working three crap jobs with no security, with a barely working twelve year old car and a fridge that just died, your ability to be creative with your life is next to zero. Hope is important, yes. Being positive and seeing the potential in your life is important. But for so many, the probability of living a life in which real freedom exists is so low as to be meaningless. It is easy, in the shiny and carefully crafted narrative of co-creative self-empowerment, to forget this.